The KONG Cat Kitty KONG is a durable food dispensing toy for cats. 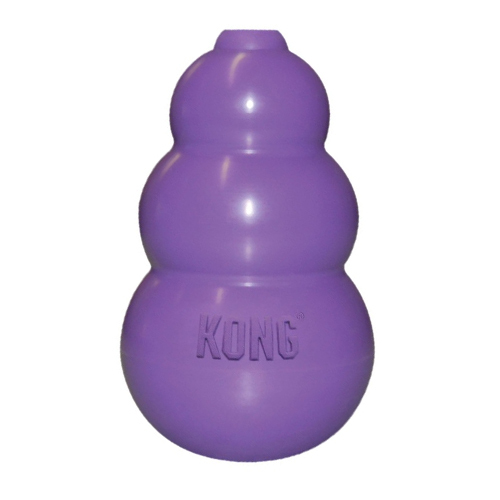 It has the recognisable shape of the KONG Classic for dogs and is made from natural rubber. You can fill the toy with food, treats or catnip, which your cat has to try to get out. The KONG Cat Kitty KONG is a durable toy for your cat. The toy is made from natural rubber and has the same recognisable shape as the KONG Classic for dogs. You can fill the Kitty KONG with treats, food, or catnip, which your cat has to try to get out. This stimulates your cat's senses. The Kitty KONG also bounces unpredictably, which will challenge your cat even more. Have you used KONG Cat - Kitty KONG before? Let us know what you think about this product.